In Sunday’s Kitsap Sun we ran an article about the effects of Initiative 1183 on the liquor sales industry to mark the voter-approved initiative’s one year anniversary. The story was a combined effort between myself and reporter Rachel Pritchett. What often happens when you have two reporters working simultaneously on a story is that not everything you report or write is included in the final product. That was the case with my section of the story dealing with how Washington’s wine industry has grappled with the new law. Because only a fragment of what I wrote was included in the story, I am posting my full story below. This blog is probably the best location for this anyway, seeing as the story is wine specific and this is a wine blog. I’m also including the photos Meegan Reid took that fell to the cutting room floor with my story. While campaigning for Initiative 1183 supporters laid out reasons why the state should be removed from the liquor business. A selling point was the belief that a competitive marketplace would mean better selection and savings for consumers, while increasing business opportunities for retailers and local wineries. But those against the initiative cautioned removal could have the opposite effect. A year later, local winemakers and Washington wine industry leaders weigh in on the effects of 1183. Small wineries that produce 3,000 cases or less a year that rely on wine club memberships and direct-to-consumer sales have largely been unaffected by 1183. Large wineries, like Chateau Ste. Michelle Estates that produces more than 1 million cases a year, have transitioned easily into the new market because they have experience selling in other states with a similar structure, according to industry experts. It’s the mid-sized wineries, those producing between roughly 5,000 and 40,000 cases a year, that have been affected by the new law. “As you get larger in production you can start to play the games that 1183 allows you to play. Whereas when you’re more in the 6,000 to 10,000 case range, that gets to be a little more difficult,” said Sean Sullivan, founder of Washington Wine Report, an online publication dedicated to Pacific Northwest wines. Sullivan is also the Pacific Northwest wine reviewer for Wine Enthusiast magazine. Sullivan was against 1183. A month before the election he wrote an article predicting there would be less room on grocery store shelves for wine if the law passed. He also guessed it would be difficult for Washington’s small wineries to compete for that space because they wouldn’t be able to offer discounts on wholesale purchases like large wineries, including many coming in from California. 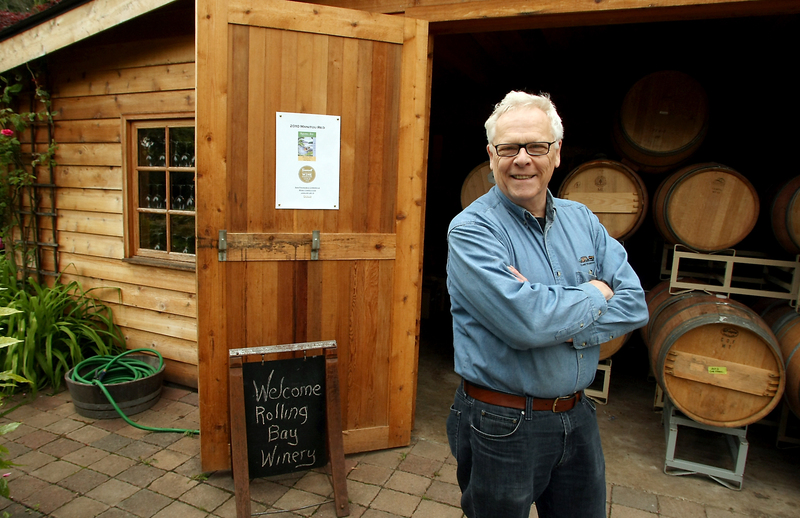 That’s been the experience of Bainbridge Island winemaker Hugh Remash, who owns Eagle Harbor Wine Company. Unlike his peers on the island, Remash set up a business model focused on wholesale and not direct-to-consumer sales to drive profits. His wines are found in local restaurants, Town and Country Market and Central Market and boutique wine shops on the east side of Puget Sound. “What happened is a poor law was changed into a bad law,” Remash said of 1183. When 1183 passed big businesses like Total Wine and BevMo! — which offer one-stop shopping for beer, wine and spirits — moved into the state. The majority of their wine inventory comes from California, making it hard for Washington wineries to compete for shelf space because they can’t offer the same bulk discounts. These large stores hurt small boutique shops where Remash and other winemakers sell handcrafted, artisan Washington wines. Remash attributes the decline to the passage of 1183 and the fact consumers are choosing convenience over experience. As Sullivan predicted, some national grocery stores like Safeway, took away shelf space from wine and replaced it with liquor, reducing the wine inventory. Smaller wineries like Eagle Harbor Wine Company had a chance to sell to stores like Safeway before 1183, but now they’re not buying. Wholesale discounts were another bonus touted by 1183 supporters before the election. Previously Washington laws prohibited retailers from storing alcohol in warehouses. Now they can purchase larger quantities and ask for wineries to sell them at a discount. Large wineries — like Chateau Ste. Michelle, which owns more than half of the state’s grapes — have enough inventory to take advantage of these new regulations, but the majority of Washington’s wineries are too small to be able to offer the same discounts. 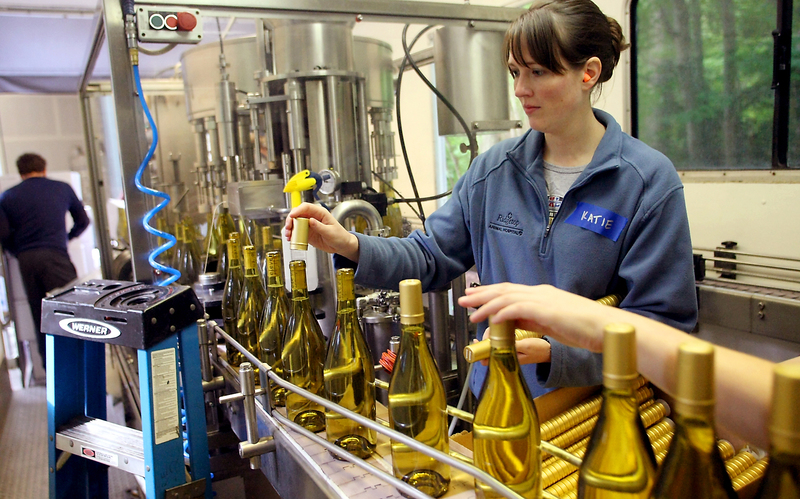 Washington is the second largest wine-producing state in the nation but most of its more than 740 wineries produce 3,000 cases or less a year. As a result they and can’t offer competitive wholesale discounts because they don’t have the inventory. Unlike the other wineries on Bainbridge, Remash doesn’t have a wine club where members pay to receive wine on a regular basis. He’s reconsidering that decision. “I’m thinking about starting a wine club because I’m losing wholesale sales,” he said. With an annual production of 2,000 cases a year, Matt Albee, winemaker and owner of Eleven Winery, is the largest wine producer in Kitsap County. 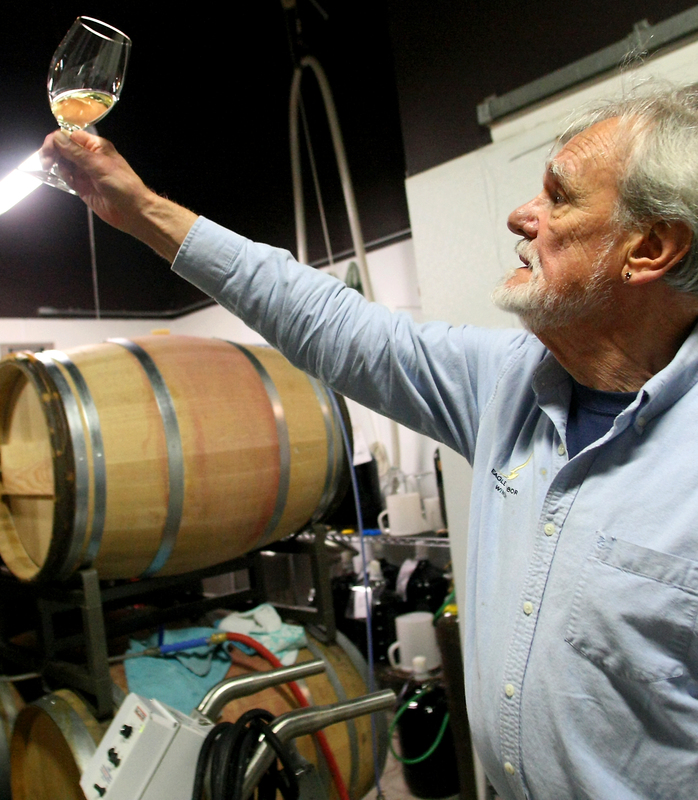 Almost 95 percent of his wine is sold through his wine club and tasting room sales. Albee hasn’t felt direct effects of 1183 like Remash, but he agrees the law isn’t as favorable as it was advertised. Big stores like Costco and Total Wine are the ones who have benefited, he said. Alphonse de Klerk, winemaker at Bainbridge’s Rolling Bay Winery, has no interest in competing for shelf space in those stores. His focus is on getting into restaurants like Seattle’s Metropolitan Grill, where his wine is offered. “It was more of a topic before it was passed and now it’s like the wave has passed us over,” de Klerk said. Marty Clubb, owner and managing winemaker of Walla Walla-based L’Ecole No. 41 Winery, agrees the effects of 1183 have yet to be realized. Clubb is the president of the Washington Wine Institute, a nonprofit representing wineries, growers and associations across the state by advocating on their behalf in Olympia. The institute remained neutral on 1183. L’Ecole produces 40,000 cases annually and didn’t feel the effects of 1183 because as one of the oldest in the state it is established among consumers, restaurateurs and retailers, Clubb said. Paul Beveridge, president of the Family Wineries of Washington, another group advocating on behalf of wineries, agrees more time is needed before 1183 can be evaluated. Beveridge is the winemaker and owner of Wildridge Winery, which opened in Seattle’s Madrona neighborhood in the 1980s. His group favored 1183. One area of the law he’d like to see changed is eliminating the restriction that prohibits shop smaller than 10,000 square feet from selling liquor. No matter a wineries size or how 1183 plays out in the years to come, industry leaders agree if winemakers continue to produce quality wine consumers will buy it. “The good news is, if you make good wine there’s a market for that,” Clubb said. Between sips of sparkling wine on New Year’s Eve I had a chance to try a small amount of Walla Walla favorite L’ecole No. 41 Winery’s 2009 Apogee. This red wine is sourced from Pepper Bridge Vineyard and has been a regular fixture at the winery since 1993. It’s the winemaker’s attempt at capturing the vineyard’s “distinctive and characteristic spicy bold aromas, dark fruit flavors, robust tannins and rich structure,” according to the L’ecole website. I’ve tried a handful of wines that have been made from Pepper Bridge Vineyard lots and almost always I’ve felt the flavor was powerful — in some cases more powerful than I would regularly want to drink. That is my preference, and of course a lot depends on the winemaker and the winemaking style they choose when making the wine. five rackings over 22 months, according to the website. The wien carried the weight and depth of the complex vineyard flavors, but left me wanting to refill my glass once it was empty (I didn’t though because I was waiting for the countdown to pop the cork for 2013).